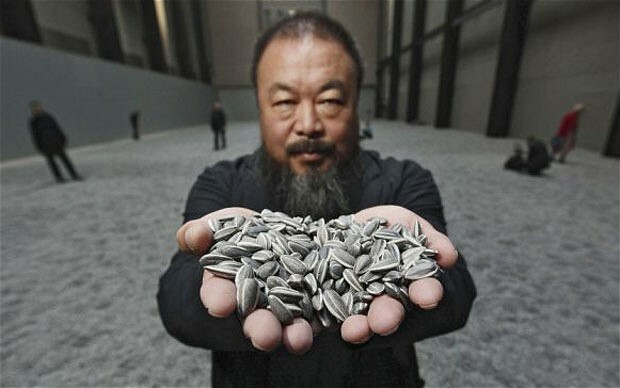 For those who unfamiliar with the name of Ai Weiwei, he is a Chinese contemporary artist very concerned with the social matters, we could categorize him, generically, as an activist for human rights in China, but influential worldwide. He is active in sculpture, installation, architecture, curating, photography, film and social, political and cultural criticism. This long list of genres that Weiwei is involved in come together in the Venice Biennale Edition this year. 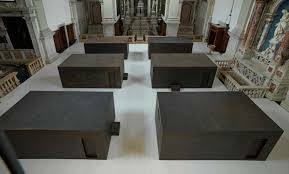 After his imprisonment in China 2011, he created an installation based on 6 metal shipping containers with a Cor-Ten exterior. From the outside, a minimal sculpture installation, the inside, not minimal at all. The interiors contain 6 different memories captured as a 3d photograph, fully detailed; his own memories sculpted half size. These can not been accessed and these scenes are able to be seen from portholes in both the side and the top of the containers. The different containers show scenes from him showering in front of prison guards, him waking up with guards staring at him, him being interrogated, him eating, … This work has been named S.A.C.R.E.D (Supper, Accusers, Cleansing, Ritual, Entropy, Doubt), this initials respond to the different actions that take place as for the place where it is being displayed, Sant’Antonin church. Despite the fact that this exhibit is not under the Architecture section (which means nothing), I feel very inspired by him as an architecture student. No matter what your main interest in architecture may be /design, engineering, theory or interior design among many many other options) we should all learn from Ai Weiwei. A man true to his principles, fighting to enlighten the rest of the world about China’s irregularities against all odds; and a Renaissance man, able to bring together into one creation many aspects of different unrelated fields. There will be no true architects if we keep specializing more and more and forget about many other knowledges that will improve us as individuals and, specially, as outstanding architects.